Recently the Polish guitarist Łukasz Kuropaczewski was guest at the Academy of Music of Zagreb with Krzysztof Meyer’s guitar piece “Triptych” and presented the Croatian premiere there on 12 February 2016. The concert was part of the Zagreb Guitar Festival. After several first premieres of the Sonata for Guitar solo in Germany, Poland, Belgium and currently Croatia as well the world premiere in the USA (23 July 2015 in Katonah/New York), Kuropaczewski tours now to Canada with “Triptych”. 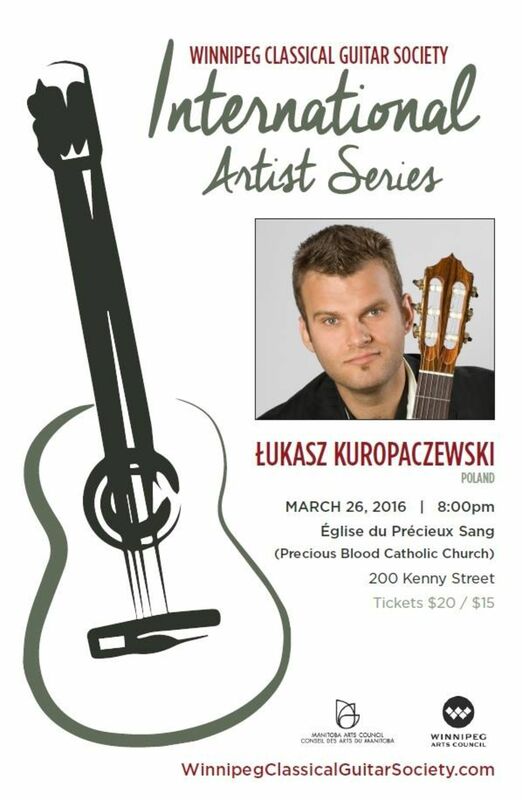 On 26 March 2016 he will perform the Canadian premiere of Meyer’s solo work, composed in 2014, in the Precious Blood Catholic Church in Winnipeg during the course of the “International Artists Series” of the Winnipeg Classical Guitar Society.